Do We Expect Too Much From Christmas? Picture Christmas at Fezziwig’s. Everyone dressed in their best, a fiddler propped up on ‘the lofty desk’, and everyone dancing and singing and eating. No football, no television, no opening the gifts and rushing home! Just music and games and joy. This has always been the Christmas of my dreams. Has it ever come true? No. But it’s there in the back of my mind and plagues me every year. But maybe I and we all want too much from Christmas. For what other holiday do we have such high expectations? Not Easter? Not Independence Day? Not even Thanksgiving? Take the songs that play between Thanksgiving and New Year’s Day. They suggest that we should some how end world hunger, that we should find romance, and that everyone will wish us ‘good cheer’. And don’t forget the parties and mistletoe. The movies are no less optimistic. Think of It’s a Wonderful Life or Miracle on 34th Street or even my favorite A Christmas Carol. They tell us that Christmas isn’t just one holiday out of many but is a once-a-year life-changing event. That’s a lot of pressure for one day. I say let’s give Christmas a break. As a one-day-out-of-the-year holiday it can’t fulfill all of our wishes and with that kind of hope it can only leave us depressed and disappointed. Let’s let Christmas be Christmas. Not a day set aside for us but a day set aside for Him. 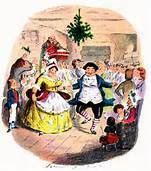 This entry was posted in My Writings and tagged Christmas, Christmas Carol, It's a Wonderful Life, Miracle on 34th street by M.A. Foxworthy. Bookmark the permalink. Reblogged this on A Merry Band of Travelers.